The best Etisalat data plan you can enjoy for July is definitely the etisalat bis on android, permit me to welcome you to the month of July, still on the etisalat bis for android, well I cant say when or how soon it would last, but will definitely list it among etisalat data plan for July you can make use of. However, on how long the etisalat bis plan on android might last, well I can sure tell you not for long, but then as of the time of this post it is still blazing, once it stopped working I definitely will update you. Back to etisalat data plan for july, well there are very few data bundle plan you can enjoy on etisalat, but thats not to say they aren’t cheap, in fact in this post we will unveil to your how you sure can get Etisalat 1gb data for just #600. Unlike Glo that offers a huge 10gb data for just #2500 which to me is a great deal of data bundle, etisalat on the other hand has same 10gb data but doesn’t goes that cheap, in fact its a bit expensive. Without further delay let go straight to the complete list of etisalat data plan for July, and not to forget we sure will include cheaper plan just for your enjoyment. The First point of contact is etisalat 1gb for 600, and of course 2gb for 1200, pls note this plan are solely for data reseller, in order words you are buying the data from a third party, however it is very legit, no scam involve, and all data valid for 30days. Etisalat data Reseller price for Data!! 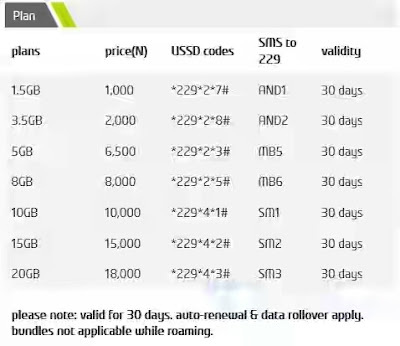 The last but not the least on etisalat data plan for July is the official etisalat data bundle that offers 1.5gb for #1000, 3.5gb for #2000, however its 5gb goes for #6500 so you see the data from third party seems to be quite Affordable compare to this. There you have it, go for which ever suites or meet your pocket.